Bhojpuri actress Akshara Singh is one of a versatile actress of the industry. From acting to singing, she is a multi-talented actress and never fails to impress the audience with her stint. Earlier today, she took to Instagram to share her picture posing like a boss lady and we can’t get enough of it. Dressed in a shimmery jacket and stylish aviators, she is seen sitting on a bike. She has accessorised her look with subtle makeup, tresses neatly open and straight. Her expressions in her latest photo will definitely make your heart race faster. Recently, on the occasion of the new year 2019, her new song ‘Darling Tu Time Pe Aa Jana’ has released and went viral on social media. In the song, Akshara is seen dancing along with the background dancers on the beach. Dressed in casual wear to dress, Akshara looks mesmerising, as always. The song has been sung by Akshara Singh and the lyrics have been penned down by Manoj Matlabi. The music has been composed by Ghunghru Ji. The song has garnered more than three million views on YouTube. 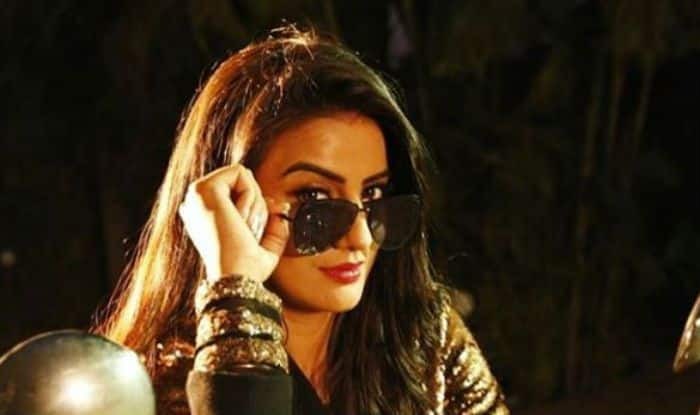 For the uninitiated, Akshara Singh is one of the most sensational actors of the Bhojpuri film industry. She has worked in a number of Bhojpuri films with all the top Bhojpuri actors such as Ravi Kishan, Pawan Singh, Khesari Lal Yadav, Dinesh Lal Yadav, among many others. The actress is famous for her raunchy performances on songs like Akhiyon Se Goli Mareba, Dhadkaa and Balam Ji Love You. Earlier, she shared a video of her grooving to popular number Chadti Jawani Meri and, of course, killed it with her expressions.